One of the most important parts of any building is the roof. It keeps the people who are inside protected from the elements and helps to protect the building structure from damage caused by the ingress of water. Most people don’t spend too much time looking at their roof – they just know it is there and presume it is doing the job it was designed for. Unfortunately, this can mean that essential roof maintenance is forgotten, and the need for repair or replacement is rarely noticed as soon as it should be. 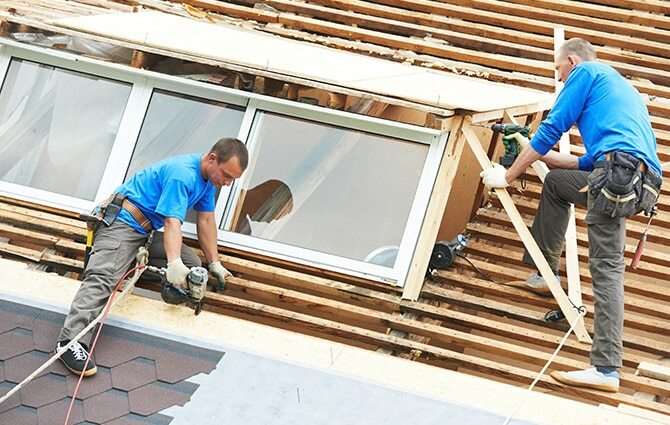 We provide commercial roofing and residential roofing services in Florida for all kinds of a roof. We’re not just a tile roof company or a shingle roof company, we install roofing systems, roof replacement, and repair almost any kind of roof. Looking for a metal roof company? You’re in the right place! From roof leak repairs to major renovations, our professional and highly-skilled team is ready to tackle your roofing job. All of our team members are fully trained and operate to the highest safety standards, ensuring that your roof is looked after just as well as you are. The climate of Florida, especially around Coral Springs, means that it can often be warm and sunny – but when the wind and rain hits, it hits hard. This makes a structurally-sound and leak-free roof a necessity all year round. When was the last time you had your roof checked for damage or leaks? Our prices are truly competitive, and you can trust us to do a great job each and every time. We always put our customers in the first place, and we do everything we can to make sure your job runs smoothly and meets and exceeds your requirements. We always complete our work to the highest standards and want to provide a service that means you will recommend us to your friends, family, and colleagues. We’re proud of the roofing work we do, which means that you can be proud of your building too. We want your roof to look its best no matter what the weather brings. If you need roof leak repair in Coral Springs, you can trust Tornado Roofing to get the job done for you. Coral Springs is known for being hit by hurricanes and making sure your roof is sound and in good order, before hurricane season begins will keep your property as safe and dry as possible. Even if your roof has already suffered from hurricane damage, we’ll be able to advise and assist you towards restoring your roof. We offer an emergency roof leak repair service in Florida that is certain to help should a problem occur. We provide roofing services across Florida and will be equally happy to work with you for your Coral Springs commercial roofing or residential roofing needs. If you need a new roof, a roof repair, or help with leaks or any other kind of roof damage, get in touch with Tornado Roofing today and let us help to solve your roofing problems.